TWISP, Wash. – When fire came to the Methow Valley in July 2014, the difference between essential and non-essential became startlingly clear. 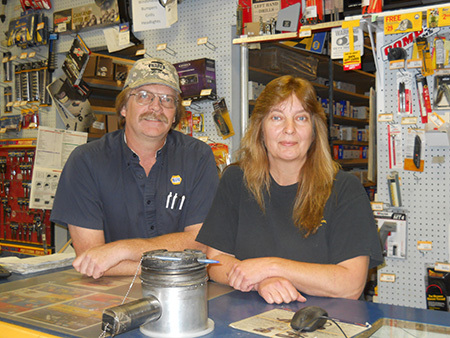 Very quickly, Dwain and Erika Hutson realized that it was essential to keep their NAPA Auto Parts store open. With central Washington ablaze in what would become the biggest conflagration in state history, the tiny town of Twisp became the staging area for many of the 3,000 firefighters from across the United States who were battling the wildfires. The Hutson’s store quickly became a hub of activity. Neighbors came looking for flashlights or a generator, face masks or a respirator. Most customers sought parts to repair trucks, bulldozers, water tenders or tankers needed on the fire line. In most cases, if the Hutsons didn’t have a part, they could get it within 24 hours. “It was insane,” Erika said, laughing at the memory. Dwain and Erika Hutson in their NAPA store in Twisp. “We just got hammered,” said Dwain, who had served as chief of the Twisp Volunteer Fire Department for more than 16 years and was familiar with the tools and supplies firefighters needed. But the sustained intensity of those needs was challenging, to say the least. Their work was further complicated when fire destroyed power lines and closed the town’s two main highways. As soon as the power went out, the Hutsons fired up their generator and kept it going non-stop for eight days. When delivery vans couldn’t get through, Erika jumped in her truck and made the 120-mile round-trip to Chelan to pick up orders. The Hutsons have owned the NAPA Auto Parts business in Twisp since 2008, but their history with the store goes back nearly 30 years. On Jan. 1, they were able to buy the building as well, giving them the paperwork to prove what locals already know: the Hutsons own a piece of the heart of this rural Washington community. Dwain started working for owners Tom and Shirley Berschauer at the store in 1982 when he was 22 years old. In five or six years, he became the manager – a position he held for more than two decades. Erika started working part-time at the store about 15 years ago and the two married in 2002. That’s about when the Berschauers told Dwain that they wanted to start planning the business succession and wondered if Dwain was interested. He was. As manager of the Twisp store, he had worked with NAPA for years and liked the business model that would allow him to be an independent owner. That description fit the Hutsons, but they knew that coming up with the down payment would be difficult. The money was one challenge. Putting together a loan application and business plan that would meet with NAPA approval was another. “We didn’t know what to do,” Erika said. Fortunately, they had heard about the Small Business Development Center (SBDC) and called Lew Blakeney, the SBDC certified business advisor for Okanogan County. The Washington SBDC (http://www.wsbdc.org) is a network of more than two dozen business advisors who meet with small business owners across the state to help them start, grow or transition their businesses. The Washington SBDC receives support from Washington State University, the U.S. Small Business Administration and the Economic Alliance of Okanogan County in north-central Washington. With Blakeney’s help, the Hutsons created a fact-filled binder for the lender that was two inches thick. They were apprehensive about their trip to Atlanta to present their proposal to NAPA officials, Erika said, but the meeting went more smoothly than they could have imagined. “They said our proposal was one of the most complete they’d ever seen,” she said. Since 2008, the Hutsons have continued to meet with Blakeney to discuss ongoing issues such as inventory, staffing and accounting practices. He has helped the couple work toward long-term goals such as purchasing the building. That milestone was reached this year when they took over ownership of the building and property on Twisp’s main thoroughfare. Their new goal is to have the building paid for by 2021, which will be a huge asset as they begin planning for their own business succession.